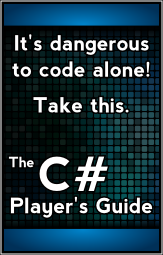 I'm a big fan of your C# Player's Guide and I'm currently working through your XNA tutorials on this site. I'm a bit old fashioned, however, and enjoy having a physical book in my hands. I'm just curious if you have any plans on putting together an XNA book to go along with the C# guide? 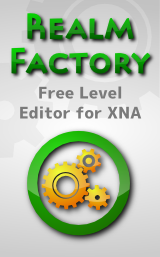 I know that Microsoft is going to stop supporting and updating XNA, so I'm not sure if you'd consider it a good use of your time, but it's something I'd find awesome if you did! If not, what plans, if any, do you have? And lastly, just wanted to say thanks for putting this site together and getting this information out there! It can be difficult for a beginner like me to find resources that are simple, coherent, and well organized. It was the user friendly nature of your tutorials that helped me decide on C# and XNA as my starting language / engine while teaching myself programming. I'd go with MonoGame, but the current state of their content management leaves a lot to be desired. Literally 80%+ of the questions I get on this site have to do with MonoGame content pipeline problems. It just doesn't work like it needs to. When they get things figured out (they have a content pipeline of sorts, but it requires digging into development builds) then I'd be far more open to doing a book like that. So… aside from that, the question is what book is next? First priority for me is a second edition of the other book, so that it's ready for an update the day Visual Studio 2015 and C# 6.0 are officially released. I know that's kind of mundane when you've already got a copy of that book (albeit first edition) but that's where my time is currently going. After that, though, I have several options. I've already put quite a bit of work into three separate books. 1. A Base Class Library/Framework Class Library "sequel" to the C# Player's Guide. This would get into the common types (like IEnumerable, List, Dictionary, IDisposable, etc.) and how to use them. It's intended to stay away from functional areas (so no WPF, ASP.NET, Windows Phone specific stuff) and be useful to all C# developers. 2. A book focused on game math and physics. It teaches you about matrices, vectors, intersection/collision detection, lighting calculations, etc. The math seems to be a stumbling block for a lot of people, and it's an area I personally enjoy and want to help others with. I don't think I'd be aiming for XNA or MonoGame with this, per se. My aim would be to be framework/engine agnostic, but I'm sure it will be fairly heavily XNA/MonoGame influenced (perhaps with some Unity in the mix). 3. A book about SharpDX. I have a personal fascination with SharpDX. I like the idea of having the ability to use the power of DirectX without having to deal with C++. (I just like C# so much better than C++.) But I'll admit that I haven't done a ton in this area yet, and there would be a lot of learning that I'd need to do myself before teaching others. (Though that's likely to happen anyway.) They've got an XNA inspired interface in addition to the raw DirectX one, so it would be an easy transition for most people who know XNA. I have other books swirling around in the back of my mind as well. They're not well enough formed for me to start giving any details, and they're likely lower priority than the above three. Of course, the hard part here is that I want to write books that people will be interested in buying. It's tough to know what people want. I ask people about these ideas whenever I get the chance, but there's a huge margin of error here. So getting suggestions like you've done is very helpful to me in determining how to best spend my time! I would find the math and physics book extremely useful. When it comes to art and math, most people tend to be stronger in one area than the other. That's certainly true for me!